On Thursday, my Mister and I headed into Durham City Centre to attend the official launch of the new Woven (Gentleman's Outfitters) store on Elvet Bridge. 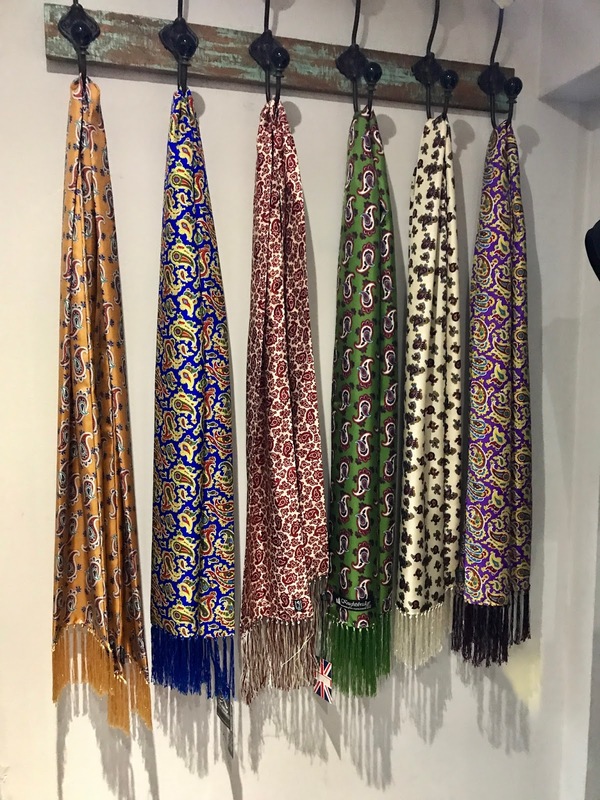 Woven is the place to be for Menswear in Durham, offering a bespoke service including suit hire, tailoring, made to measure and the best of British casual wear and occasion wear all under one roof. 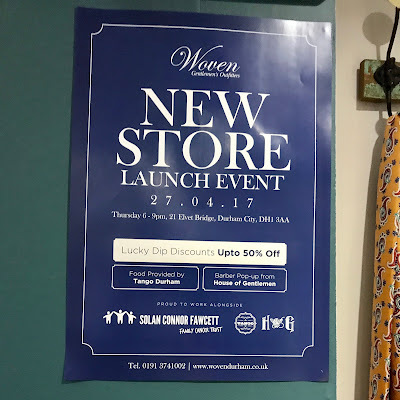 Chris and I have been shopping at Woven for years and attended many events at the store's previous location in the recently demolished Gate shopping centre (read about the last one here). We were really looking forward to see what the evening had in store! For those of you that know Durham City Centre, Woven is now situated in the old Van Mildert store, a perfect building to house such a cornucopia of fashion. We arrived just after 7pm, to find the store already buzzing with people. Always a welcoming atmosphere, we were offered drinks on arrival before spending our time browsing the store's three floors in their entirety. My Mister was also offered a goodie bag just for coming along-always a nice touch! Aquascutum coat, beer and goodie bag in hand, ready to shop! We started our evening's browsing up on the first floor, the new home of formal wear. 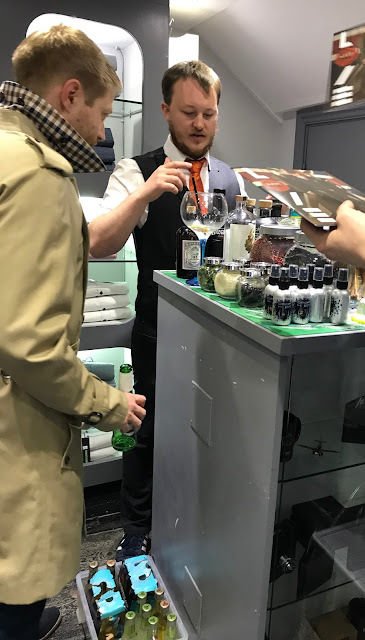 House of Gentleman, a male grooming service also based on Elvet Bridge, were on hand to offer free traditional shaves for those fancying a trim whilst perusing the latest in bespoke formal wear. Chris was more interested in the fashion, not really having that much to shave, and was really impressed with the range of suits on offer. I really liked the pocket squares and was obsessed with a bumblebee print one I found hidden in one of the drawers! Bumblebee print shirts are available too! Next it was down to the lower ground floor to shop shoes, accessories and sale items. Here we found a lovely little pop-up Gin bar, allowing Chris to refuel and try out a berry Gin. 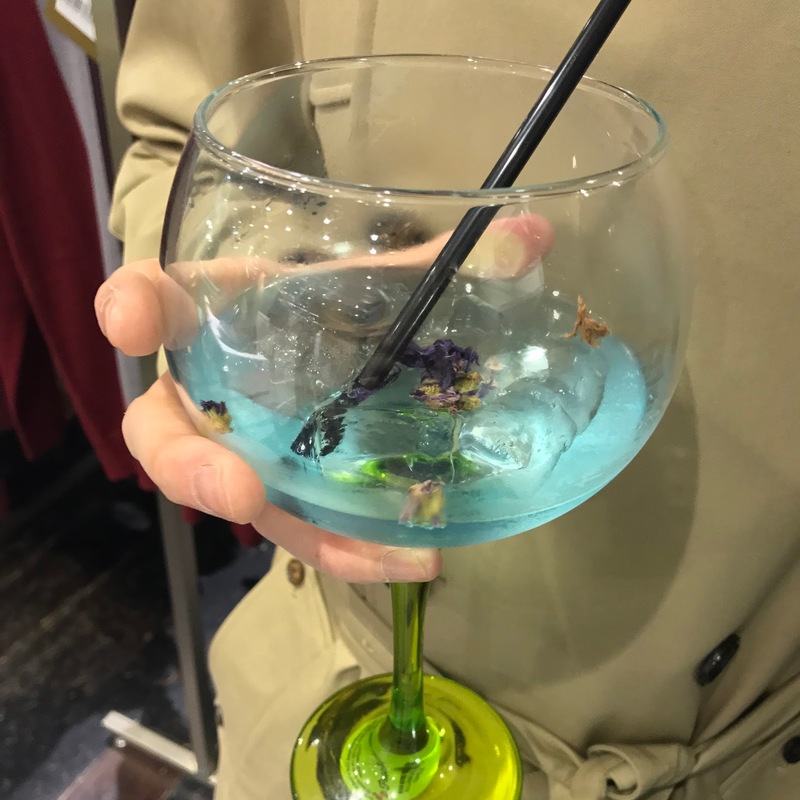 A pocket-sized gin bar is soon to open opposite Woven, so the owners were on hand to tell us all about it, and to get my Mister good and drunk! 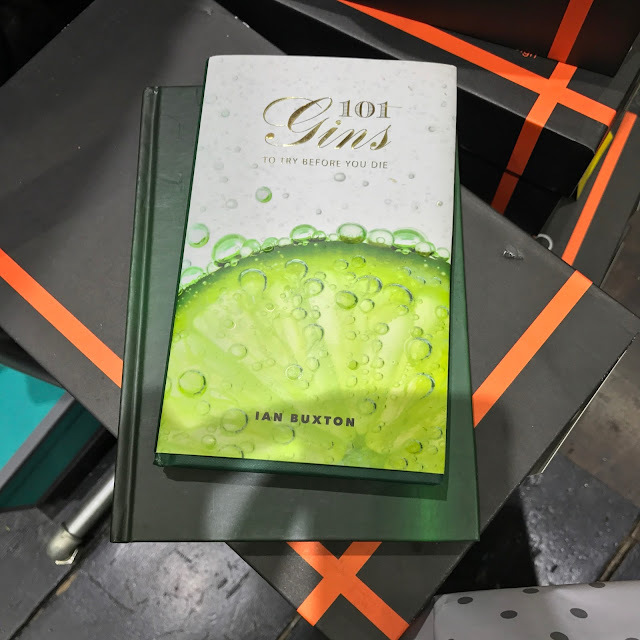 Opening is yet to be announced, but if the Gin delights on offer were anything to go by, it's set to be the perfect place for your Gin education! Finishing on the ground floor (or street-level whichever you prefer!) 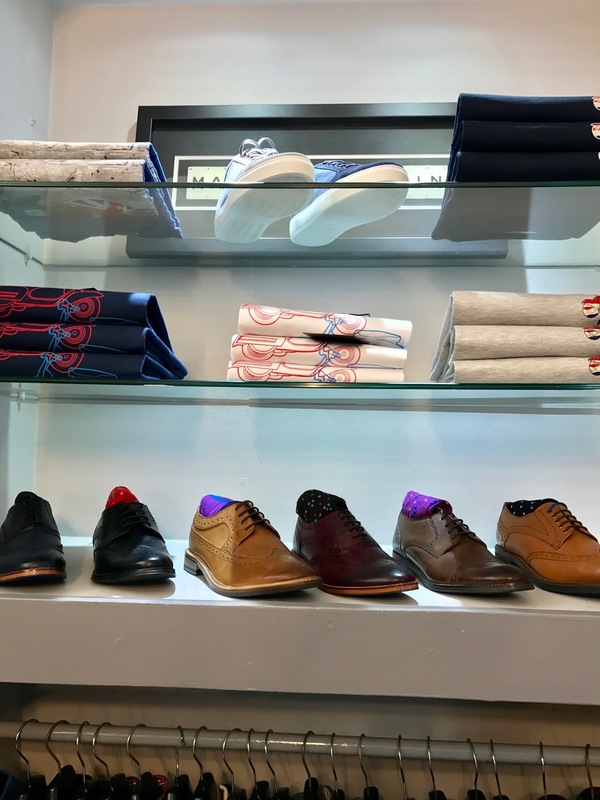 there's a great selection of casual wear with many brands from Merc to Gabicci Vintage to name a few. My guy had his eye on a beautiful blue Merc Harrington jacket, but as he already has two from the store, he managed to pull himself away! Both Chris and I were really impressed with the new store and its new layout and with so much on offer it won't be long before we're back again! If you're male, it's the perfect place to meet all of your fashion needs under one roof, with everything you'd ever need to fill your wardrobe, whatever the occasion! Or if, like me, you love shopping for your man, you'll be bowled over by the range of amazing British fashion on offer; I love the store! Thanks so much to the staff at Woven for such a wonderful evening, we had a great time!